Blessed Lorenzo Maria Salvi, also known as Blessed Maria of St. Francis Xavier, was born on October 30, 1782 in Rome, Italy. He was a member of the Passionist Congregation. He studied for the priesthood at the Jesuit run College of Rome, and his classmates included the future Pope Gregory XVI. He was impressed with the preaching and zeal for the faith of St. Vincent Strambi, and soon followed him into the Passionist Congregation. He entered and became a novice at Monte Argentario, in 1801, the first monastery of the Passionists. He received the religious name of Lorenzo Maria of Saint Francis Xavier, and professed his vows on November 20th, 1802. He was ordained a Priest on December 29, 1805. Napoleon had anti-clerical laws, and he saw that the Passionist monastery was shut down, and its members dispersed. When Lorenzo was able to return to Passionist life he preached missions and encouraged devotion to the Passion of Christ, the two things that are the hallmarks of the Passionist life. Lorenzo was devoted to the Infant Jesus and often wrote about and preached on the wonders of the Incarnation. Ever since this devotion, he is always depicted in religious art with a picture of the Child Jesus. Lorenzo was made Rector of the Passionist Mother House in Rome, Saints John and Paul, but spent much of his time preaching missions. His Vice-Rector was Blessed Dominic Barberi. 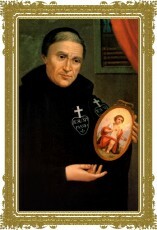 St. Lorenzo Maria Salvi died at Capranica, Viterbo, Italy of natural causes at the age of 74. Pope John Paul II beatified Blessed Lorenzo Maria of St. Francis Xavier, on October 1, 1989. He was buried in the Passionist Church of St. Angelo, Vetralla. Blessed Lorenzo Maria Salvi, also known as Blessed Maria of St. Francis Xavier, was born on October 30, 1782 in Rome, Italy. He was a member of the Passionist Congregation. He studied for the priesthood at the Jesuit run College of Rome, and his classmates included the future Pope Gregory XVI. He was impressed with the preaching and zeal for the faith of St. Vincent Strambi, and soon followed him into the Passionist Congregation. He became Rector of the Passionist Monastery, but spent most of his time preaching and promoting devotion to the Passion of Christ, the two hallmarks of a Passionist Priest. He had a strong devotion to the Infant Child Jesus. He was credited with many conversions for his preaching.